A make up holder that hangs inside of a medicine cabinet! A functional and cute space saver to keep bathroom counters clean. This is what my make-up has been in since we moved here 3 years ago. No organization whatsoever. Usually it isn’t an issue since I don’t wear much make-up, but when I went to clean it out one day I noticed a couple of pairs of earrings that I didn’t know were in the bottom along with some old mascara. 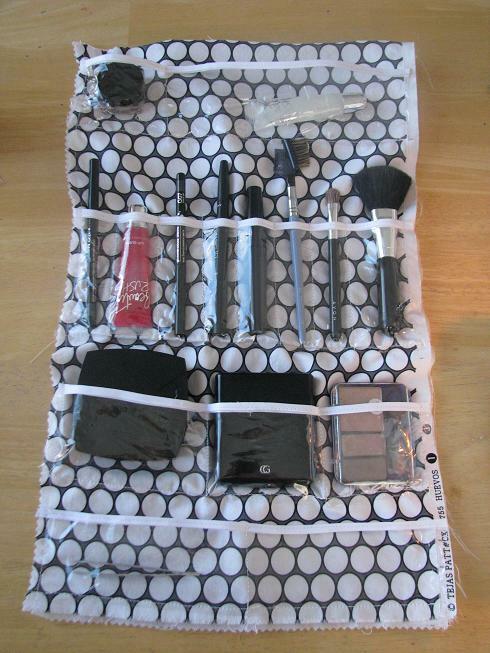 It’s a small bag and was already crowded without having useless make-up in it so I decided to try something new. 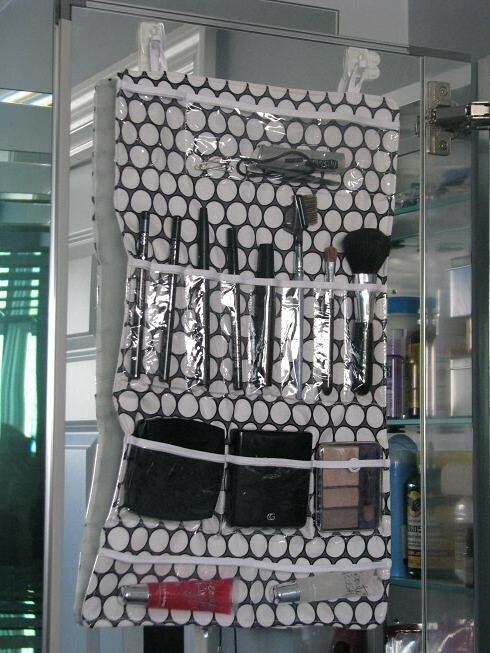 A hanging make up holder! I cut two pieces of fabric (one for the front and one for the back) to fit the space on my medicine cabinet. I also pinned areas for pocket placement. I made sure that the pockets didn’t interfere with the shelving in the medicine cabinet so that it would close all the way. 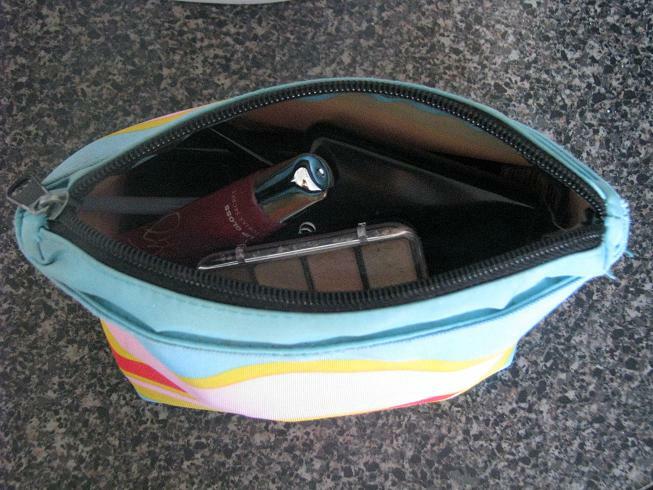 Using extra vinyl from a shower curtain bag in this project, I cut pockets and trimmed them with bias tape along the top. 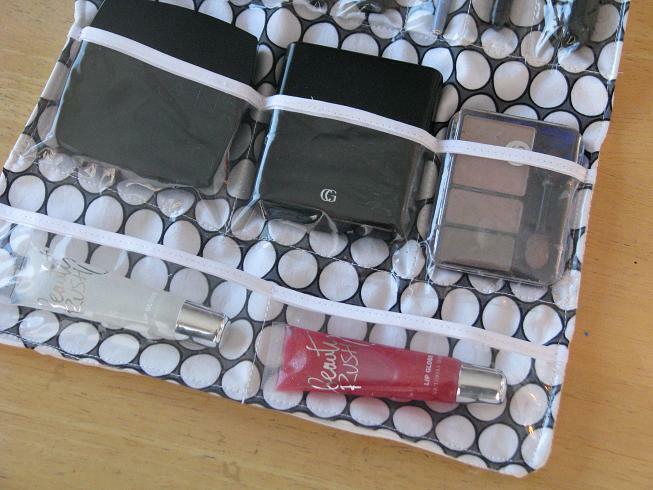 I sewed dividers and placed all of my make-up inside to make sure everything lined up correctly. I pinned a couple of bias tape loops to the top for hanging. Then I sewed the vinyl in place to the front piece of fabric, flipped it over and sewed the front to the back fabric with right sides facing and left a small area to turn it right side out. Then I turned it right side out and top stitched all the way around, catching in the hole that I used to turn the fabric. To hang it, I used 3M adhesive hooks. I wasn’t sure how they would hold up, but it has been 6 months since I made this make up holder and they are still working perfectly! I love my new system. Everything is laid out perfectly, and as if I couldn’t get any more low maintenance, it helps me get ready even FASTER. Bonus! Stop on by my Easy Organizing Ideas board on pinterest for more space saving ways to organize your home! Looks fabulous! I could sure use an organizer like yours instead of digging through my bag! I love that you can see what’s in each pocket! mine was just for brushes. 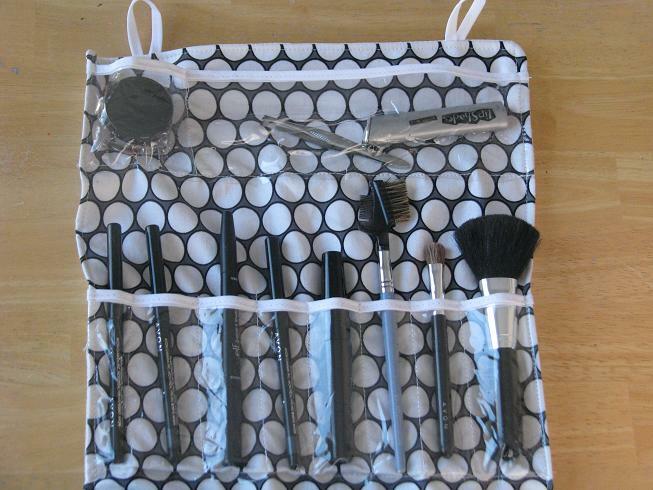 I never thought to put slots for my makeup too. Great idea! Sorry, I can’t find your email address on the site. But, I wanted to personally invite you to submit some of your favorite ideas to “Or so she says…”. If you go to http://www.oneshetwoshe.com, you will see a tab “Guest Posts” that will explain everything to you. What a great idea. So smart. So vinyl sews okay? I’ve wondered about it but now I’m more willing to try it. What a great idea! 🙂 My make up organization sounds like what yours use to be. I should make me one of these. It turned out great! I have pattern for something similar but it folds up so you can pack it with you when you travel. I love this. I need to make one of these babies…and soon! My makeup is all over in a drawer, and it’s not working out anymore.